If the tool you want doesn’t exist, Amazon Web Services (AWS) gives you the platform to build your own. That was the case with Wayne State University as they struggled with finding a portal that allowed them choice, innovation, and mobile support (at an affordable cost). 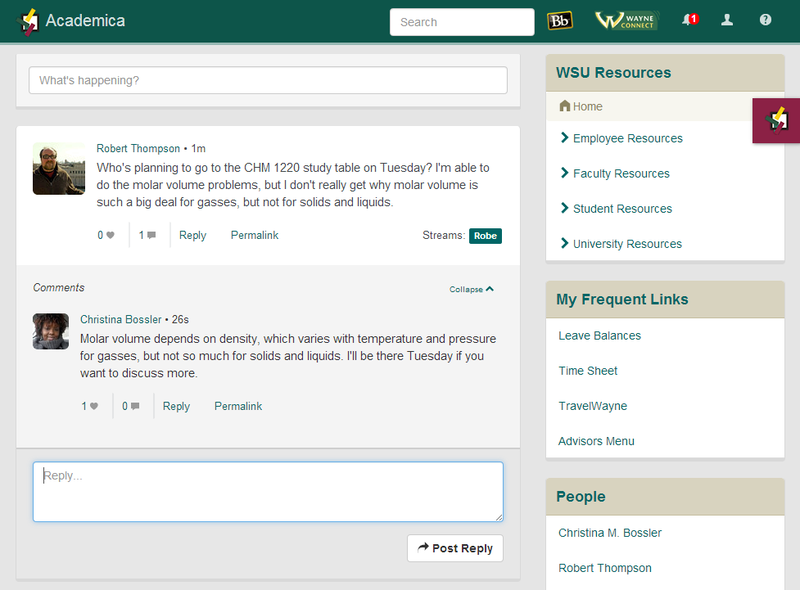 Previously, Wayne State had a traditional intranet portal, where faculty, staff, and students would log in to register for classes, check grades, and learn about what was happening on campus. With this original system, they were often tied down by hardware maintenance fees, an inability to scale, and an old way of communicating marked by laundry lists of links and little engagement and interaction with users. The university wanted to make their portal a destination for people to do business and collaborate with Wayne State. In February of 2012, they made the decision to look at other portals, but could not find exactly what they were looking for in the market. Wayne State decided to build their own portal, using AWS as a platform. The university built an Enterprise Social Portal (ESP) called Academica that provides students with access to all key student facing university systems, including email, Blackboard LMS, payment systems, course tools, and admissions application status. The platform is cross-device, cross-platform and responsive on all devices. In addition to basic core features of a portal such as SSO, there is a social media aspect with a “Twitter-like” real-time messaging platform for the school that allows for hashtags and other social mechanisms. See the image below. “With cloud hosting, the sky is the limit. We can now adapt to the needs of the campus,” Rob Thompson, Senior Director, Academic, Core & Intelligence Applications, Computing & Information Technology, Wayne State University. “We save money on the licensing costs, we have halved our maintenance costs by going to AWS. We no longer buy for the high-water mark. We provide a consistent user experience, no matter what day of the year,” Mike Gregorowicz, Systems Architect, Wayne State University, added. Scalability – By looking at the needs of their campus and finding new ways to better their services, they can now easily scale to 75,000+ users and well beyond that. “By far, the most powerful thing for us has been dynamic scaling. We can scale up and scale out at times to meet the limits of spot instances, resulting in even more savings,” Mike said. Zero Downtime – Rob and Mike can do updates any time of day with zero downtime. Although they prefer to do updates on the weekends, they know that, in emergency situations, they can make updates without disrupting their visitors. Shareable – When they first started building and deployed the portal, it caught the attention of other schools who needed this type of innovation on campus. This model allows them to share their platform with other schools. They are now able to commercialize their product and share their model through Merit Network, a non-profit organization providing research and education networking services, as well as other services. Since deploying Academica at Wayne State, they have even received interest from schools around the globe. Learn how you can realize some of these benefits with AWS by visiting the “Cloud Computing for Education” page.